If you are using CiraSync Personal Edition (PE) and want to upgrade to Enterprise Edition (EE), you will be able to Sync the GAL (or public folders) to smartphone users in your tenant. You must use a Global Administrator account on your Office 365 tenant. A best practice is to establish a new dedicated service account. The Global Administrator account must also be a granted the Application Impersonation role. Since it can take up to 30 minutes for role modification to propagate, we recommend you do this first. The instructions to add app impersonation using the Office 365 admin console are located in a blog post on our website. If you are currently logged into the CiraSync Personal Edition dashboard, click the orange button at the bottom: UPGRADE TO ENTERPRISE EDITION. 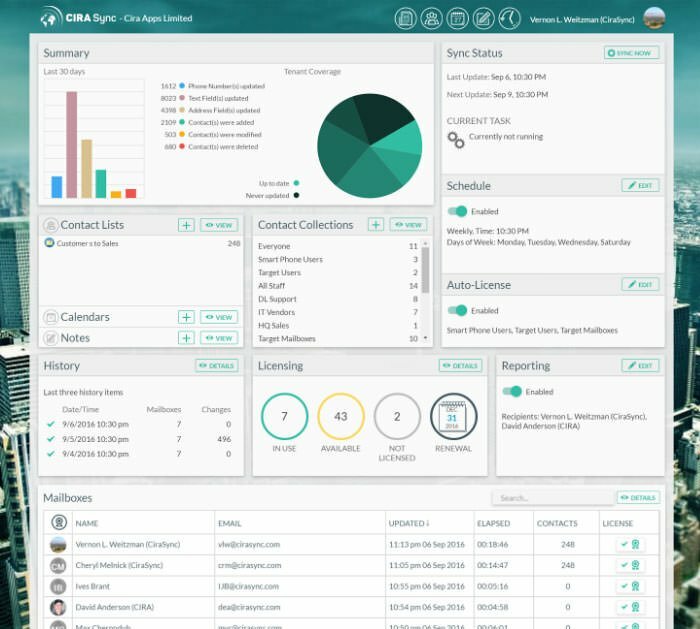 If you are presently logged out of the CiraSync dashboard, use this URL to skip directly sign up for CiraSync EE https://dashboard.cirasync.com/signupenterprise. You will be prompted to log on using Office 365 credentials. As stated above, you MUST have Office 365 Global Administration rights. Note: If you get an error after logging in, observe the error message below. The most likely cause of the problem is that you are logging in with an account that does not have Global Admin permissions on your Office 365 tenant. If you successfully entered credentials for an account with Global Admin rights, you will need to grant additional consent for CiraSync Enterprise Edition. Configure and populate a smartphone users Collection with at least one pilot user. Auto license the smartphone users. Schedule a sync task to run once a day.